A no-fuss way to prepare your Easter holiday ham. Easy to prepare and sweet and juicy to eat. You'll have extra time to visit with your guests while the glaze does all the work. When it is ready to serve, you will have an extra special ham that friends and family will think you spent hours fussing over. 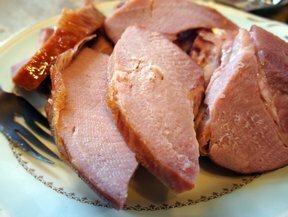 If you prepare a spiral ham for Easter, follow these step-by-step instructions to see how easy it is to cut apart for serving. See our easy instructions on how to make these fun Easter nests. Then let the kids have fun filling them with treats.